Sony keeps pushing new phones to the market like there’s no tomorrow. 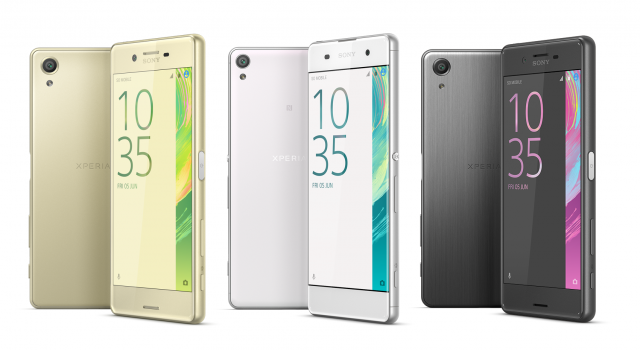 Three new phones in the Sony Xperia X-series were unveiled at the ongoing Mobile World Congress: Xperia X Performance, Xperia X and Xperia XA. Sony Xperia X isn’t a new product series, since it already contains the existing, old X8 and X10 models. Hence, one can think of the newly introduced phones as a new segment within the Xperia X-series. Similar to Sony’s Z5 Premium phone, X Performance is a flagship phone that will cost consumers about $1,200. Sony itself refers to it as a “masterpiece”. A high-performance Snapdragon 820 processor ensures speedy response for any type of usage. It has 3GB RAM memory and 32 GB storage. Please bear in mind that the operating system requires about 12 GB, so the effective storage amounts to about 20 GB. The camera is top-notch at 23 MP resolution and ISO of 12800/3200. A mid-range model priced at around $1,000 that offers a performance not far away from the more expensive X Performance. The memory and storage is the same as X Performance’s, and the camera resolution is identical even though other aspects of the camera isn’t as powerful. Xperia X supports fast charging and the battery has 2,620 mAh. A budget model that will retail around $530 in NZ. The screen has a resolution of 720p and is powered by a Mediatek processor. Sony rarely disappoints when it comes to cameras, and the Xperia XA comes with a 13 MP camera and a f/2.0 sensor. It has 16 GB of storage, but the operating system itself apparently occupies 5 GB. Are there too many Sony Xperia phones? Sony offers a very broad and varied product range for smartphones. PriceMe already lists 64 Sony Xperia phones including variations. One can’t stop wondering why Sony has decided to produce so many models of phones, since it’s quite hard for consumers to decide upon which model to choose? Is it the pressure to catch up with rivals Samsung and LG that causes Sony to constantly trying to launch a successful model? Another concern is how Sony motivates its customers to spending more than a thousand dollars on a new phone when it’s likely that an upgraded version will launch within six months?